The Florida Department of Agriculture and Consumer Services has confirmed several recent additional premises with strangles in the state — bringing the total number to 42 in the past year. Strangles, a highly contagious upper respiratory disease found in horses, was first reported in the 13th century and can now be found worldwide. Being highly contagious, strangles is a reportable disease in the state of Florida. Cases have been reported most recently in Palm Beach County, Manatee County, and Volusia County. To check the latest reports, go to equinediseasecc.org/ alerts/outbreaks. The Equine Disease Communication Center (EDCC) works to protect horses and the horse industry from the threat of infectious diseases. Its online communication system is designed to seek and report real-time information about disease outbreaks in a manner similar to the way Centers for Disease Control and Prevention (CDC) alerts the human population about diseases in people. Although rare, cases of strangles have caused bacteremia and meningitis in humans and fatal pneumonia in a camel. Positive cases of strangles in equids must be reported. The strangles organism — Streptococcus equi ssp. equi — can be transmitted by direct contact with nasal or ocular secretions or lymph node discharge from infected horses. It can also be passed on by indirect exposure to contaminated trailers, stalls, riding equipment, buckets, halters, lead ropes, brushes or clothing. The incubation period typically ranges between two and six days but may last up to 14 days. How can you watch out for this disease? Symptoms may include a fever of 103 degrees or higher, nasal discharge, general malaise, pharyngitis, dysphagia, upper airway stridor and respiratory distress. Clinical signs are often age-related, with older horses exhibiting milder symptoms of shorter duration. Veterinarians primarily diagnose strangles by culturing nasal swabs, nasal washes, or via aspirations from abscesses. Nasal washes generally yield better results than nasal swabs due to their sampling of a greater surface area. Opinions vary about the appropriate treatment of horses with strangles. Experts recommend a check with your veterinarian to determine which treatment is right for your horse. There are also vaccine options. Treatment often consists of rest, water, moistened food and a clean, dry stall, which is generally sufficient for most cases. There are preventative measures, such as establishing high standards of management practices. 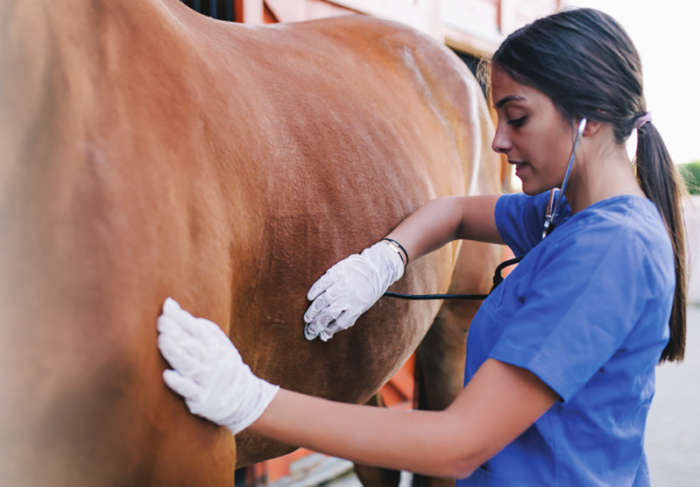 Horses being introduced to a new herd should be isolated for a minimum of three weeks and should be monitored at least twice per day to watch for fever, nasal discharge, lymph node enlargement and/or dyspnea. If possible, new additions should be screened. Quarantines may be issued on premises affected by strangles. Although human cases are rare, it is recommended that immune-compromised individuals take precautions to avoid exposure to infected horses.